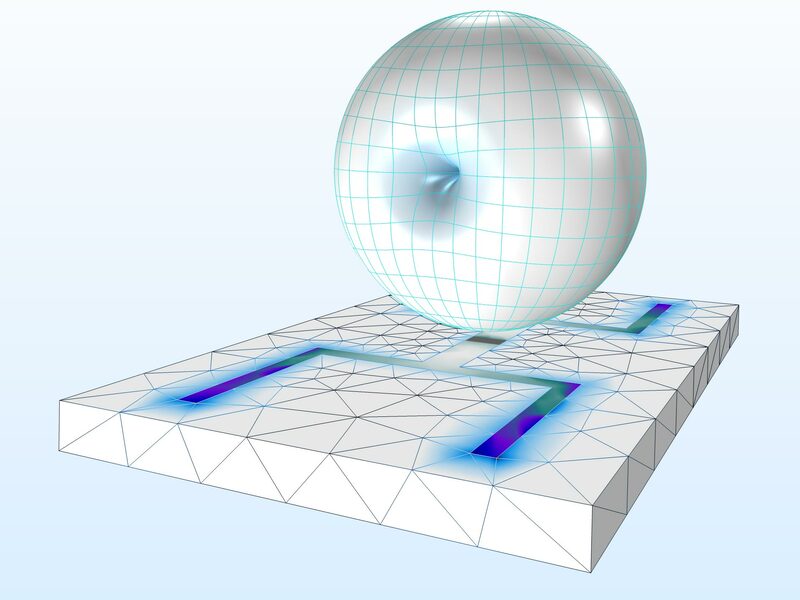 For users of the RF Module, COMSOL Multiphysics® version 5.4 brings additional far-field functionality and variables for efficient antenna and radiation pattern analysis, an extended material library for microwave and millimeter-wave circuit boards, and enhanced Application Library examples with more visualization effects and deployment of commercially available connectors from the RF Part Library. Browse all of the RF Module updates in more detail below. It is now possible to evaluate the radiation pattern of an antenna array very quickly from the radiation pattern of a single antenna element by using an asymptotic approach that multiplies the far field of a single antenna with a uniform array factor. You can find this functionality in the updated Microstrip Patch Antenna model. An 8x8 microstrip patch antenna array pattern synthesized from a single microstrip antenna simulation. The RF Module enhances its material library with more than 40 substrate materials from the company Isola Group to assist in modeling printed RF, microwave, and millimeter-wave circuits. 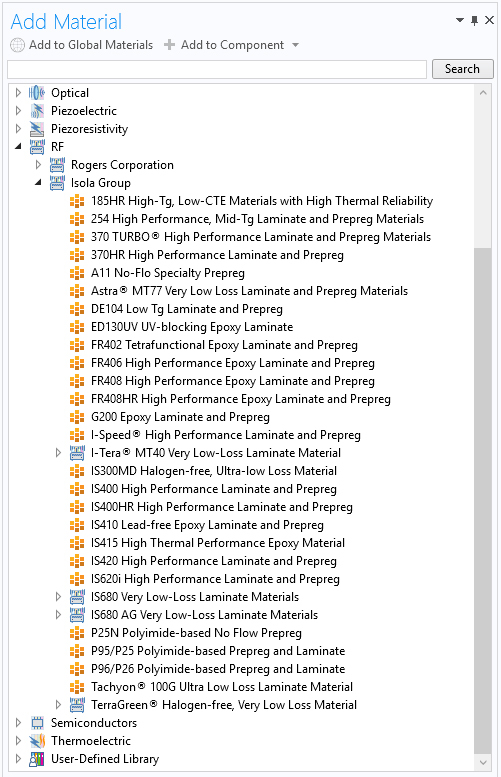 The RF Module material library now provides more than 100 substrate materials. New variables for computing the maximum directivity, gain, and realized gain have been added. These variables are available for global evaluation, without plotting a 3D far-field pattern. They can be accessed when the selection for the far-field calculation feature is spherical (in 3D) and circular (in 2D axisymmetry) and when the center is at the origin. 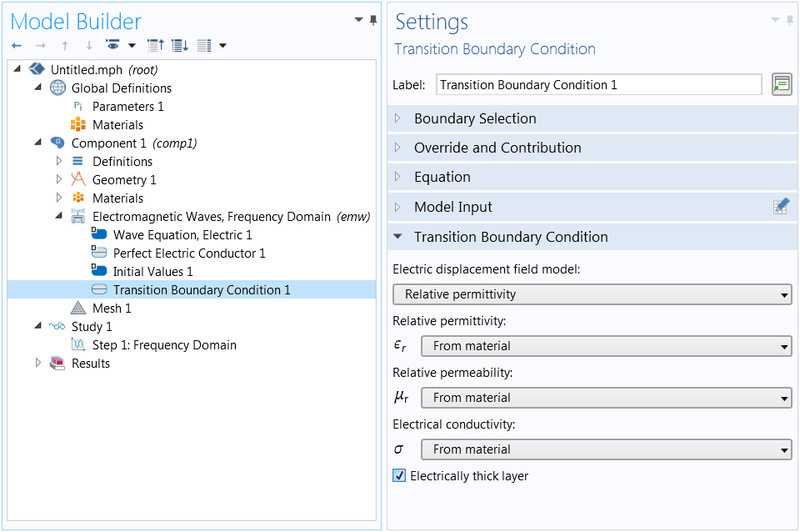 The new Electrically thick layer option decouples the two domains that are adjacent to a transition boundary condition. The boundary performs like an interior impedance boundary condition, but the layer geometry can be a surface rather than a domain. While transient analyses are useful for time-domain reflectometry (TDR) to handle signal integrity (SI) problems, many RF and microwave examples are addressed using frequency-domain simulations that generate S-parameters. By performing the frequency-to-time fast Fourier transform (FFT) after the conventional frequency domain study, TDR analysis is feasible. This type of analysis helps in identifying physical discontinuities and impedance mismatches on a transmission line by investigating the signal fluctuation in the time domain. You can see this functionality in the new Study of a Defective Microstrip Line via Frequency-to-Time FFT Analysis model. An example where a time-domain lumped port voltage is used. The overshoot and undershoot of the signal are due to the discontinuities of the microstrip line. An example where a time-domain lumped port voltage is used. The overshoot and undershoot of the signal are due to the discontinuities of the microstrip line. 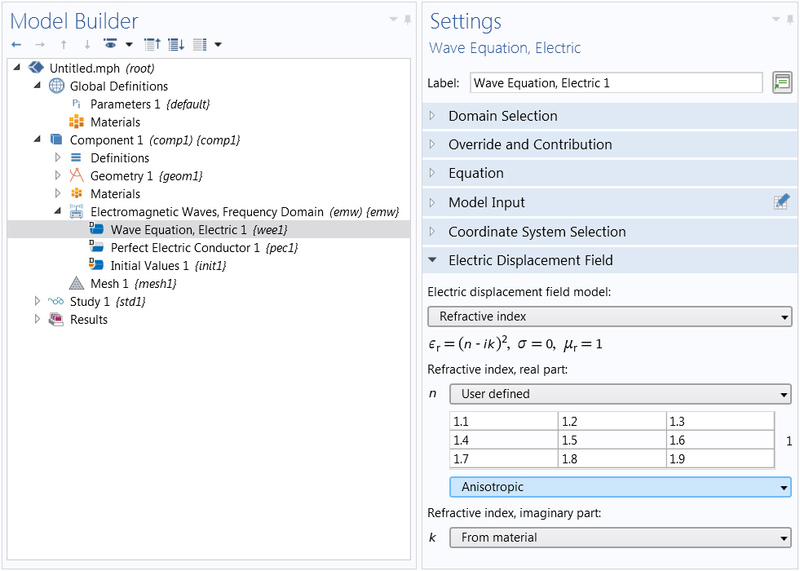 A far-field domain calculation feature is now available with the Electromagnetic Wave, Transient interface. 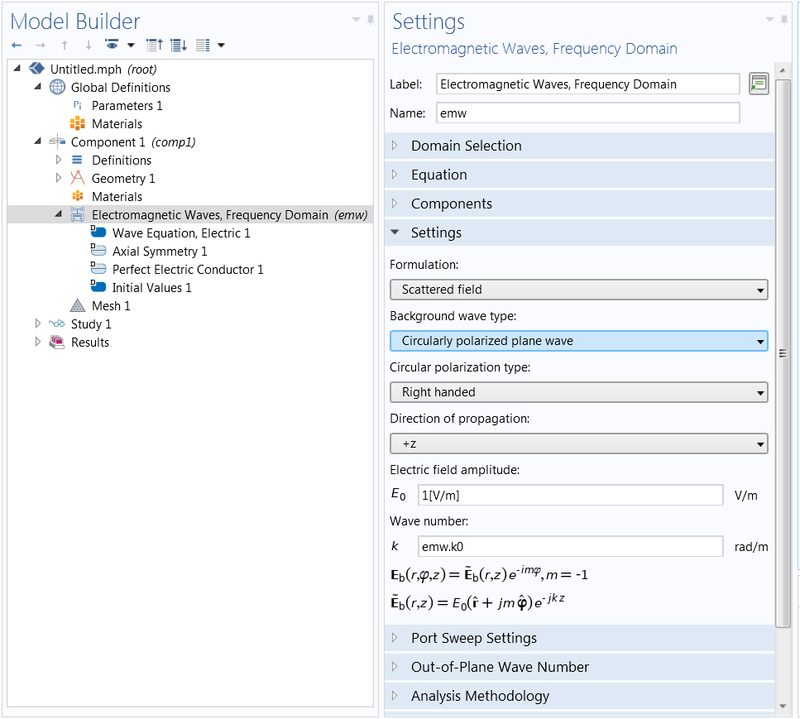 Using this feature, you can perform a frequency-domain wideband antenna far-field pattern analysis by first running a transient response analysis, followed by a time-to-frequency FFT. You can see this functionality demonstrated in the new Transient Analysis of a Printed Dual-Band Strip Antenna model. A printed dual-band antenna strip with a visualization of the far-field radiation pattern at the second resonance. The electric field norm distribution at the top of the dielectric board is also shown. 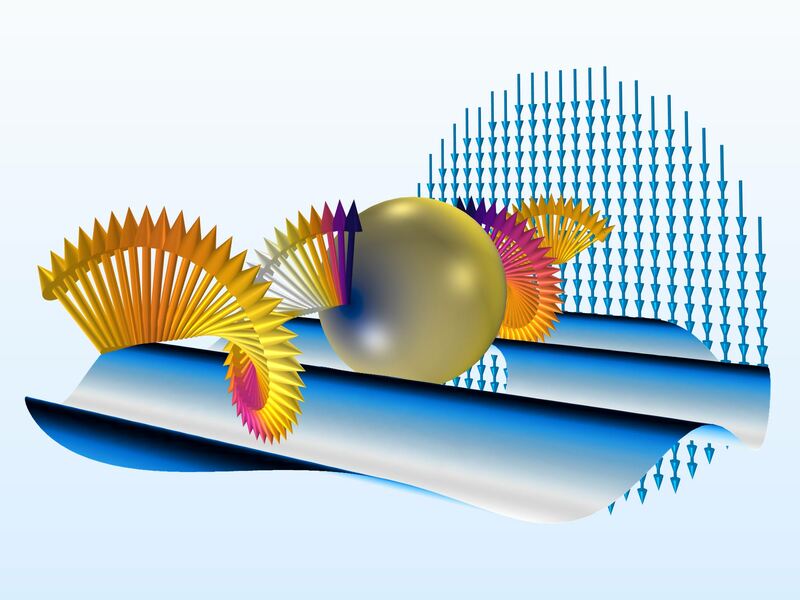 A Circularly polarized plane wave option is now available for the scattered field formulation when modeling with a 2D axisymmetric component. To use this functionality, start by exciting an axisymmetric scatterer with a circularly polarized background field in a 2D axisymmetric model. Then, by using the norm3DEfar function, estimate the far field and radar cross section (RCS) of the same scatterer in 3D, illuminated by a linearly polarized background field. 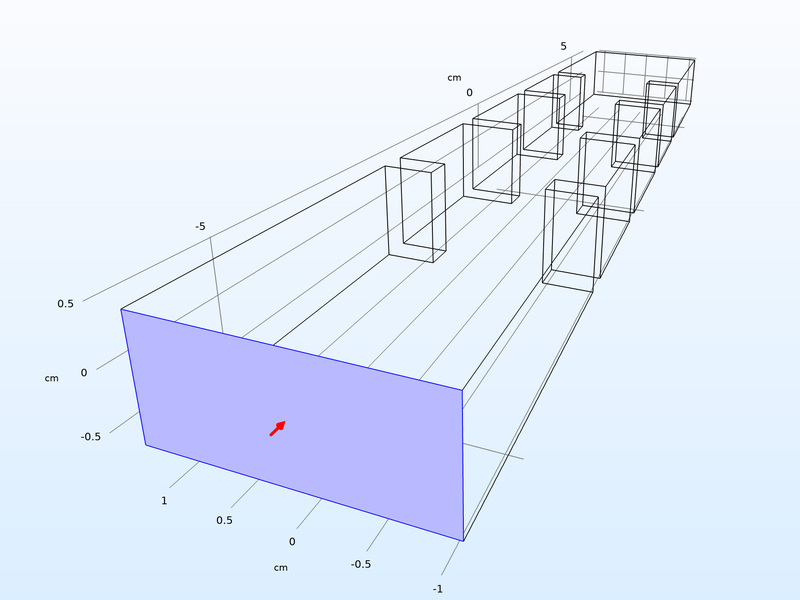 A 3D representation of a 2D axisymmetric model. The scattered field response of a 3D sphere, excited by a linearly polarized background field, can be estimated quickly by a 2D axisymmetric model with a circularly polarized background field. 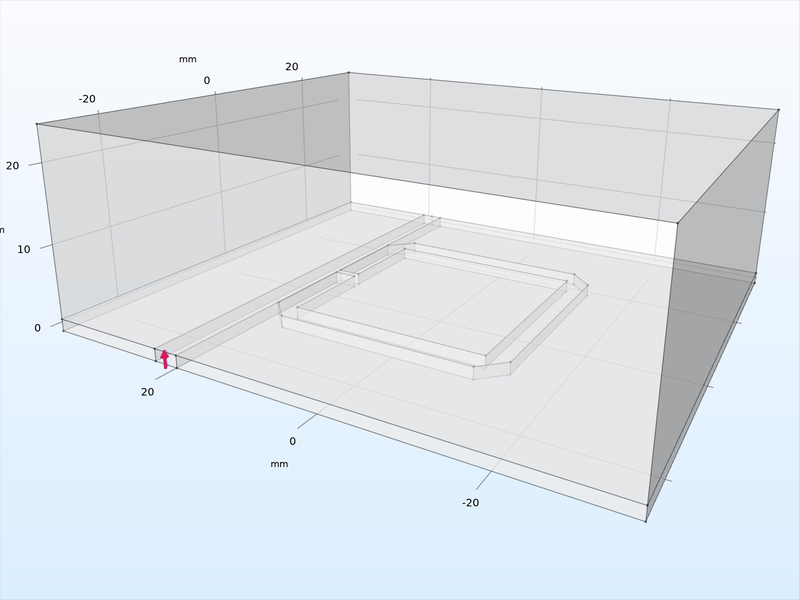 A 3D representation of a 2D axisymmetric model. The scattered field response of a 3D sphere, excited by a linearly polarized background field, can be estimated quickly by a 2D axisymmetric model with a circularly polarized background field. Arrow indicators now help to quickly identify which ports are inports (excitations) and which are outports (listeners). The arrow points in the direction of the power flow. An excited port is indicated by an inward arrow on the port boundary, while a listener port has an outward arrow. Lumped ports also support this visualization feature. 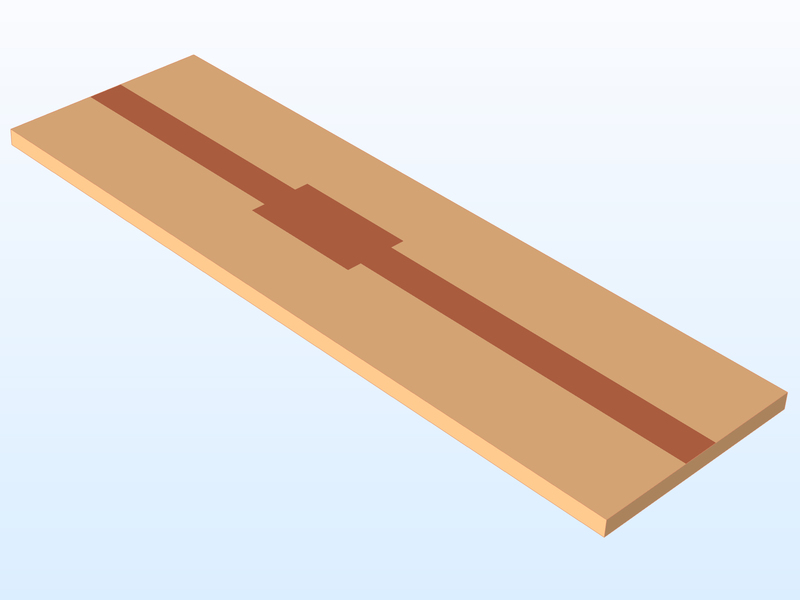 For the excited port boundary in this example model of an iris filter waveguide, the direction of power flow is shown as a red arrow. For the excited port boundary in this example model of an iris filter waveguide, the direction of power flow is shown as a red arrow. When numeric ports are analyzed by means of a boundary mode analysis, degenerated modes are challenging to handle with respect to S-parameter calculations. For better handling of such cases, the voltage drop direction is now indicated by a red arrow tangential to the port boundary, and fixes the port mode field polarization. The direction can be changed by checking the Toggle Voltage Drop Direction box in the Settings window of the Integration Line for Voltage node, which is a subfeature of the numeric TEM port feature. You can see this functionality used in the updated Notch Filter Using a Split Ring Resonator model. The voltage drop direction for a numeric TEM port is indicated with a red arrow. The voltage drop direction for a numeric TEM port is indicated with a red arrow. 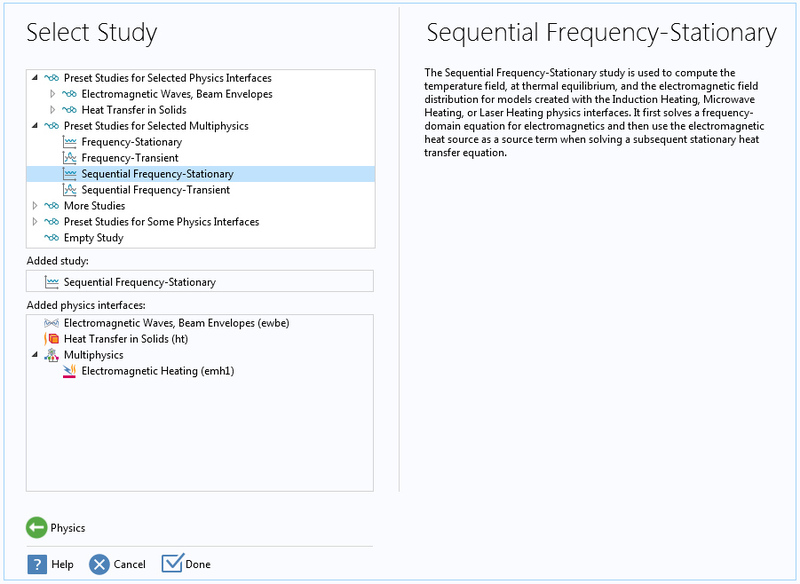 For multiphysics involving electromagnetic heating, such as Laser Heating in the Wave Optics Module or Microwave Heating in the RF Module, there are now two new study sequences available in the Model Wizard. The Sequential Frequency-Stationary study first solves a frequency-domain equation for electromagnetics and then uses the electromagnetic heat source as a source term when solving a subsequent stationary heat transfer equation. The Sequential Frequency-Transient study first solves a frequency-domain equation for electromagnetics and then uses the electromagnetic heat source as a source term when solving a subsequent time-dependent heat transfer equation. For both study sequences, it is assumed that the electromagnetics analysis does not depend on the computed temperature distribution. Whenever this simplifying assumption can be made, solving the two physics in a sequence requires fewer computational resources. When the Refractive index option is selected for the Electric displacement field model combo box in wave equation features, you can now input a fully anisotropic tensor. A matrix-matrix multiplication is used to transform this refractive index tensor to the relative permittivity tensor. 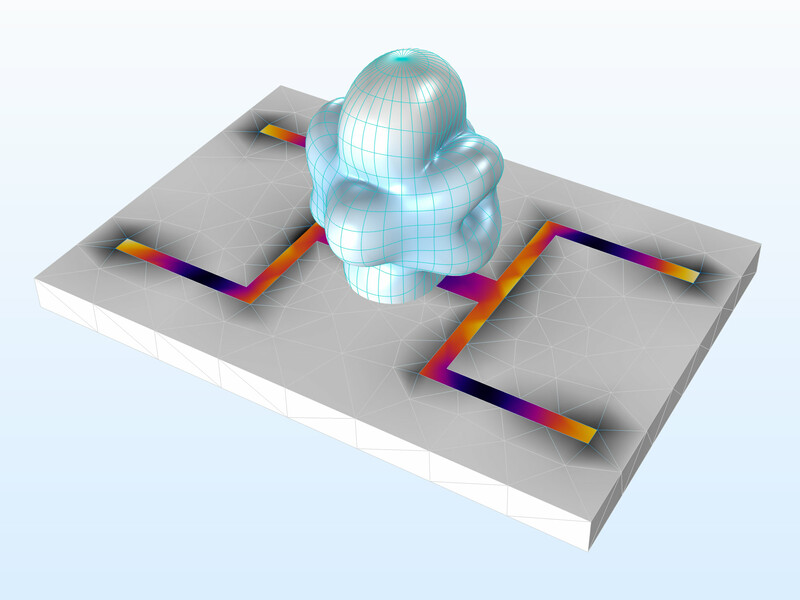 COMSOL Multiphysics® version 5.4 brings two new tutorial models. A defective microstrip line circuit board. 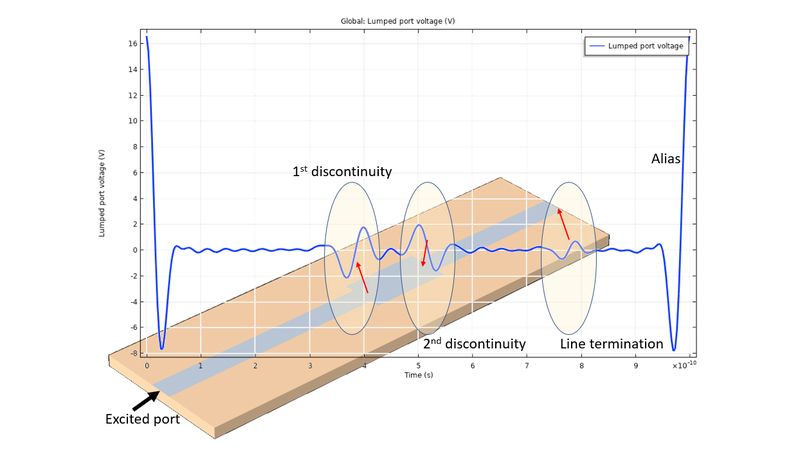 This tutorial answers the question: Can the discontinuities be detected by simulation? A printed dual-band antenna strip with its far-field radiation pattern at the first resonance. The electric field norm distribution at the top of the dielectric board is also visualized.